Robert Emmet Lighthizer (/ˈlaɪthaɪzər/; born October 11, 1947) is an American attorney and government official who is the current United States Trade Representative. After he graduated from Georgetown University Law Center in 1973, Lighthizer joined the firm of Covington and Burling in Washington, D.C. He left the firm in 1978 to serve as chief minority counsel and later staff director and chief of staff of the Senate Committee on Finance under Chairman Bob Dole. In 1983, Robert Lighthizer was unanimously confirmed by the U.S. Senate to serve as Deputy U.S. Trade Representative for President Ronald Reagan. In 1985, Lighthizer joined the Washington office of Skadden, Arps, Slate, Meagher & Flom LLP as a partner and led the firm's international trade group. On January 3, 2017, President-elect Donald Trump announced that he intended to nominate Lighthizer as his U.S. Trade Representative. Lighthizer was confirmed by the Senate on May 11, 2017, by a vote of 82–14. Lighthizer was born in 1947 in Ashtabula, Ohio, where he was raised, the son of Orville James and Michaelene Lighthizer. His father practiced medicine. He attended Gilmour Academy in Gates Mills, Ohio. He later graduated from Georgetown University with a B.A. in 1969 and a J.D. in 1973. After graduating from law school, Lighthizer joined Covington & Burling in Washington D.C. as an associate attorney. In 1978, Lighthizer left Covington & Burling to work for Senator Bob Dole (R-Kan.), who at the time was the Ranking Member of the Senate Finance Committee. When Dole became Chairman of the Finance Committee in 1981, Lighthizer became the committee's staff director and chief of staff. In the 1980s, Lighthizer hired fellow Georgetown Hoya Patrick Ewing as an intern. In 1983, during the administration of President Ronald Reagan, Lighthizer was nominated and confirmed to serve as Deputy U.S. Trade Representative under William Brock. During his tenure, Lighthizer negotiated over two dozen bilateral international agreements, including agreements on steel, automobiles, and agricultural products. As Deputy USTR, Lighthizer also served as Vice Chairman of the Board of the Overseas Private Investment Corporation. In 1985, Lighthizer joined the law firm Skadden, Arps, Slate, Meagher & Flom LLP (Skadden) as a partner. He practiced international trade law at Skadden for over 30 years, representing American workers and businesses ranging from manufacturing to financial services, agriculture, and technology. While at Skadden, Lighthizer worked to expand markets to U.S. exports and defended U.S. industries from unfair trading practices. He defended the steel industry in particular. Lighthizer served in a senior position in the 1988 presidential campaign of U.S. Senator Bob Dole. In 1996, he served as the treasurer of the Dole campaign. On January 3, 2017, Donald Trump announced that he planned to nominate Lighthizer as U.S. Trade Representative, a cabinet-level position. On January 23, press reports speculated that Lighthizer's nomination might require a waiver of section 141(b)(4) of the Trade Act of 1974, as amended, due to his brief representation of a foreign government in litigation 25 years prior. In March, White House Counsel Donald McGahn sent a letter to Senate leadership citing a Clinton-era opinion by the White House Counsel arguing that the statute was an unconstitutional limit on the president's ability to appoint his cabinet. At his confirmation hearing, Lighthizer was introduced by former Senator Bob Dole and U.S. Senators from Ohio Sherrod Brown and Rob Portman. In introducing Lighthizer, Brown said, "Mr. Lighthizer is eminently qualified, as Senator Dole said, for this job. He has a long history of fighting on behalf of American manufacturers, and I would add, American workers." On April 25, the Senate Finance Committee unanimously approved Lighthizer's nomination to serve as the U.S. Trade Representative as well as a waiver of section 141(b)(4) of the Trade Act of 1974. Lighthizer was confirmed as the 18th U.S. Trade Representative on May 11, 2017, by a margin of 82–14. He was sworn in by Vice President Mike Pence on May 15, 2017. Three days later, on May 18, Lighthizer notified Congress that President Trump intended to renegotiate the North American Free Trade Agreement (NAFTA), which would make him the first USTR to renegotiate a major U.S. free trade agreement. According to multiple media reports, Lightizer became one of the most influential Trump Administration officials and the lead figure in formulating the administration's trade policy. The media noted his agreement with Trump on trade issues. In April 2018, the media reported that Lightizer had spent $917,000 on new furnishings for two offices. Lighthizer said that the upgrades had been initiated under former President Barack Obama to replace decades-old furniture, an assertion supported by vendors who supplied the new items. Lighthizer has stated that using tariffs to promote American industry was a Republican tenet dating back to the pro-business politicians who established the party. In a 2008 op-ed, he defended protectionism. Politico describes Lightizer as "a decades-long skeptic of Beijing." Lighthizer has accused the country of China of unfair trade practices, and he believes that China needs to make substantive and structural changes to its trade policies, as opposed to only minor changes it has offered in the past. He wrote: "The icon of modern conservatism, Ronald Reagan, imposed quotas on imported steel, protected Harley-Davidson from Japanese competition, restrained import of semiconductors and automobiles, and took myriad similar steps to keep American industry strong. How does allowing China to constantly rig trade in its favor advance the core conservative goal of making markets more efficient? Markets do not run better when manufacturing shifts to China largely because of the actions of its government." Lighthizer suggested that the U.S. should bring more cases against China for failure to comply with the regulations of the World Trade Organization. In testimony before the US-China Economic and Security Review Commission in 2010, Lighthizer stated that "USTR (U.S. Trade Representative) should pursue WTO litigation with respect to all such examples of non-compliance. If necessary, Congress should give USTR additional resources to increase its ability." Lighthizer has stated "I try to be friendly in negotiations. I'm not the theatrical type. The art of persuasion is knowing where the leverage is." Lighthizer lives in Florida. He has two children, Robert and Claire, and three grandchildren. Lighthizer is known for paying close attention to his health. Lighthizer’s brother, O. James Lighthizer, is an American Civil War expert. 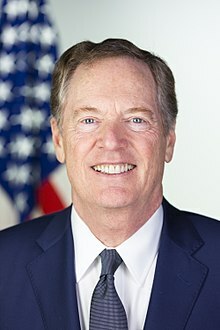 James Lighthizer is the president of the American Battlefield Trust, a battlefield preservation organization, and a former member of the Maryland House of Delegates. ^ Clarke, Sara (January 31, 2017). "10 Things You Didn't Know About Robert Lighthizer". US News and World Report. Retrieved September 18, 2017. ^ a b c d "United States Trade Representative, Robert E. Lighthizer". Ustr.gov. Retrieved September 19, 2017. ^ "U.S. Senate Roll Call Votes 115th Congress – 1st Session". Senate.gov. Retrieved September 19, 2017. ^ "The Steel Trade Negotiations; The Experts Who Will Forge the New Quotas". The New York Times. September 30, 1984. ISSN 0362-4331. Retrieved September 19, 2017. ^ a b c d Swardson, Anne (January 19, 1987). "Robert E. Lightizer". Washington Post. ISSN 0190-8286. Retrieved September 19, 2017. ^ a b Susan F. Rasky (September 30, 1984). "The Steel Trade Negotiations; The Experts Who Will Forge the New Quotas". The New York Times. ^ "Ronald Reagan: Nomination of Robert Emmet Lighthizer To Be a Deputy United States Trade Representative". Presidency.ucsb.edu. Retrieved September 19, 2017. ^ "PN189 – Nomination of Robert Emmet Lighthizer for Office of the U. S. Trade Representative, 98th Congress (1983–1984)". Congress.gov. April 15, 1983. Retrieved May 18, 2018. ^ Peterson, Matt (December 29, 2018). "The Making of a Trade Warrior". The Atlantic. Retrieved January 4, 2019. ^ "Dole for President Inc – committee overview". Fec.gov. Retrieved September 19, 2017. ^ "Trump Taps China Critic Lighthizer for U.S. Trade Representative". Bloomberg.com. January 3, 2017. Retrieved September 19, 2017. ^ "InsideTrade.com". InsideTrade.com. Retrieved September 19, 2017. ^ "Login Redirect Cookie" (PDF). InsideTrade.com. November 26, 2013. Retrieved September 19, 2017. ^ "Constitutionality of Statute Governing Appointment of United States Trade Representative". Biotech.law.lsu.edu. Retrieved December 28, 2018. ^ "Hearing to Consider the Nomination of Robert Lighthizer, of Florida, to be United States Trade Representative, with the rank of Ambassador Extraordinary and Plenipotentiary | The United States Senate Committee on Finance". Finance.senate.gov. Retrieved September 19, 2017. ^ "Finance Committee unanimously votes to approve Lighthizer confirmation, waiver". InsideTrade.com. April 25, 2017. Retrieved September 19, 2017. ^ "Lighthizer Approval as Trade Rep Paves Way for Nafta Talks". Bloomberg.com. May 11, 2017. Retrieved September 19, 2017. ^ "Robert E. Lighthizer Sworn In As United States Trade Representative". Ustr.gov. Retrieved May 18, 2018. ^ "Letter concerning NAFDTA" (PDF). Ustr.gov. Retrieved December 28, 2018. ^ Swan, Jonathan (November 19, 2017). "China hawk Lighthizer Increasingly Influential in White House". Axios. Retrieved March 11, 2018. ^ Swanson, Ana (March 9, 2018). "The Little-Known Trade Adviser Who Wields Enormous Power in Washington". The New York Times. Retrieved March 11, 2018. ^ Davis, Bob (April 6, 2018). "The Architect of Trump's Threatened China Trade War". The Wall Street Journal. Retrieved April 7, 2018. ^ a b c Restuccia, Andrew; Cassella, Megan (December 26, 2018). "'Ideological soulmates': How a China skeptic sold Trump on a trade war". Politico. Retrieved December 26, 2018. ^ Marisa Schultz (April 17, 2018). "Trump's trade rep spends $1M on new furniture, blames Obama". The New York Post. Retrieved April 17, 2018. ^ Robert E. Lighthizer (May 9, 2011). "Lighthizer: Donald Trump is no liberal on trade". Washington Times. ^ Lighthizer, Robert E. (March 6, 2008). "The venerable history of protectionism". Nytimes.com. Retrieved December 28, 2018. ^ a b Jennifer Jacobs (January 2, 2017). "Trump Taps China Critic Lighthizer for U.S. Trade Representative". Bloomberg L.P.
^ Thrush, Glenn (January 1, 2019). "As China Talks Begin, Trump's Trade Negotiator Tries to Keep President From Wavering". The New York Times. Retrieved January 13, 2019. ^ Estelle Tran (January 5, 2017). "Steel Industry Cheers Nomination of Lighthizer as US Trade Representative". Platts. ^ a b Anne Swardson (January 19, 1987). "Robert E. Lighthizer". Washington Post. Retrieved December 28, 2018. ^ "Board Of Trustees | Civil War Trust". Civilwar.org. Retrieved September 19, 2017. Wikimedia Commons has media related to Robert Lighthizer.